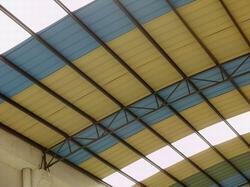 We are a leading Manufacturer of roof insulation from Chennai, India. Ideal way to insulate any home or industrial premises and give higher thermal resistance is to have it insulated through particular roof insulation material. It can give you multiple benefits including applying it over the roof as well as under roof insulation. The process of applying insulation material is comparatively easy as most of the housing roof as well as industrial ceilings have some access for caring insulation work. Apart from temperature or thermal insulation and upholding your premises or industry in better climate condition in higher temperature, low cost is another advantage why the popularity of roof insulation is increasing. One can apply as much as insulation to make it thicker and more thermal barrier as there are very little resemblance on the overall cost as well as there is no lack of space over the roof. Such roofing insulation material is available into various categories these days including single bubble insulation and double bubble insulation, however all of these formats are available in pre engineered insulation material to get the best insulation work on remote places and for larger construction. Whatever may be your need of material, you can have peace of mind about it's durability and resistance against the bad weather. In few cases the roof insulation product can guide to accumulation of moisture. This is truer for the cases where the outer atmosphere is cooler than the inner atmosphere. However, thermal insulation material made from aluminum and polyethylene films have very little chances for that. If the outer surface of the home is porous at few places, it can allow trapping of moisture or water inside. This could be even more harmful in longer run and can damage the concrete or steel roofing structure that can result into collapse. However, the situation can be prevented by providing drains and vents to make sure for the vapor to escape. Apart from temperature conversation and heat resistance, roof insulation material also gives helping hand to your pocket. It also saves money because every bit of loss in temperature can result into to higher energy consumption and higher expense. The ideal way to decide for the thermal insulation material is to ask for the specialist to inspect your roof and weather condition and suggest a material based on that.